Now, for a point-by-point specific guide to the DVD set The Lost Years by William Brown. I noticed that some sketches had different titles than was probably originally the case (no surprise, given that Warner's HBO Video unit, on their Golden Classics DVD set, likewise had things called differently from A&E's latest Complete & Unadulterated set, i.e. "The Reluctant Bridegroom" sketch from Feb. 23, 1977 as "The Wedding," or "A Feast on the Beach" from March 23, 1977 as "I Have To Watch My Figure"). Because so many people on these BBC shows did not make the transition with Benny to Thames in 1969, I will point out who was who as best I can. Some sketches I've no idea as to their origin (i.e. Fred Scuttle interviews) because they all had Jeremy Hawk as straight man. But here goes, anyway (added notes to follow): Enjoy! b. Richard Burton and Elizabeth Taylor in "Who's Afraid of Lavinia Woolf?" a. Eggbert Noggsmith sings "In the Papers"
William Brown had indeed put together a series of head shots of many of the supporting players that appeared in the Lost Years Collection. Unfortunately, the folks at Warner did not give us permission to post those images on the site. Ah, the era of intellectual properties. At any rate, I am still putting up William's extensive notes here for you to enjoy. There are no photos here, but from William's notes you may still be able to place a face to a name. Good Luck! Jeremy Hawk (1918-2002) was Mr. Hill's straight man from 1955 to 1957 and again from 1965 to 1966. His TV and film credits are impressive and include a role (as himself) in Benny's first film, 1956's Who Done It? From 1958 to 1962, he hosted a quiz show, Criss Cross Quiz; was also straight man to American comedian Sid Caesar (of Your Show of Shows and Caesar's Hour fame) in a British version of the 1958 TV series Sid Caesar Invites You. He last worked with Mr. Hill on one of two editions he (Benny, not Mr. Hawk) hosted of the 1967 Anglo-American variety show Spotlight (not to be confused with the venerable British casting directory of the same name). Father of actress Belinda Lang. (He interviewed Benny in many of the sketches in this collection, in the same way that Nicholas Parsons and Henry McGee would in the Thames years of the series, threerandot). Character actor Roger Avon (1914-1998) appeared on TBHS in 1958 and again in 1965 (was in the May 8, 1965 "Brandyball" sketch). His film and TV credits are also numerous; among which include a role in the Doctor Who movie Daleks: Invasion Earth 2150 A.D. (1966). Legendary comedy actress June Whitfield appeared in the April 20, 1968 edition of TBHS. Was also in two of his last three BBC shows (including the very last, on Dec. 26, 1968), as well as some 1961 episodes. Is best known today for her role as "Mama Monsoon" in the Britcom Absolutely Fabulous (a.k.a. "AbFab"). Susan Clark appeared in her only TBHS episode on May 8, 1965. And yes, it is the Susan Clark who, in the 1980's, co-starred with her real-life husband, ex-football star Alex Karras, and diminutive child actor Emmanuel Lewis in the American sitcom Webster. Was also in a first-season episode of Columbo in 1971, and also famous for playing Olympic athlete turned golfer Babe Didrikson Zaharias in a 1975 made-for-TV movie. Australian actress Sue Donovan made her only TBHS appearance on Nov. 27, 1965, introducing the "International Folk Singer" portion of the "Audience Research" sketch. Was also one of the lady passengers in the original old-film sketch (called "Passengers of Passion" in this version). From 1969 to 1972, she hosted the Australian children's show Adventure Island, and other acting credits include The Paul Hogan Show and Prisoner: Cell Block H. Since the mid-1970's, she's been known as Sue McIntosh, and for years was an anchor of ABC (Australia)'s nightly newscasts. One of her children (from her former marriage to Australian actor Terence Donovan) is Jason Donovan, a onetime co-star of the long-running Australian soap Neighbours (on which the likes of Kylie Minogue, Natalie Imbruglia and Holly Valance [whose grandfather was Benny's cousin] also appeared at one time or another), and a self-proclaimed Benny Hill fan according to at least one of the Hill biographies. A more recent picture of Sue can be found at www.news.com.au/heraldsun. Supporting character/comedy actor Felix Bowness introduced the "Round Britain Poetry" segment of the "Audience Research" sketch as on Nov. 27, 1965. Was also in the Dec. 18, 1965 and Jan. 8, 1966 editions of TBHS. For many years, he was an audience warm-up man on numerous BBC comedy shows. Actress Rosemarie Dunham made her only TBHS appearance on Nov. 27, 1965: introducing the "Cross Country Cabaret" section of the "Audience Research" sketch, and as the femme fatale in the "Passengers of Passion" sketch. Perhaps most famous for her role as "Edna" in the 1971 movie Get Carter. Bridget Armstrong made her only TBHS appearance on Nov. 27, 1965 in the "Passengers of Passion" sketch (later remade at Thames in 1971 as "Passengers of Love," with her role being played by Jenny Lee-Wright). A year prior to this appearance, she had an uncredited role as the "Lead Makeup Woman" in The Beatles' first film, A Hard Day's Night. Her credits in movies and TV stretch all the way to the 1990's; she made a guest appearance on The Goodies in 1971, as well as appearing on Monty Python alumnus Eric Idle's 1975-76 series Rutland Weekend Television. Was also in the 1977 movie For the Love of Benji. Her name was punned as "Brigitte Strongarm" in the ersatz closing credits of this sketch. Gloria Paul appeared in the April 24, 1965 episode and also appeared in the "Brandyball" sketch of May 8, 1965. They were her only two appearances on TBHS. Also appeared in the 1970 movie Darling Lili in a small role. Did much film and TV work in Italy up to as late as the 1990's. Veteran actor Dan Meaden played a muscleman in the April 24, 1965 episode. Played Detective Constable Box in the TV series Softly Softly in the 1960's. Was also a bouncer in Sean Connery's last film as James Bond, Never Say Never Again (1983; not an official Bond film, though, as it was produced by a different company than that which handled the Bond series). Peter Thomas was a supporting actor of the 1960's and '70's, and appeared in the April 24, 1965 episode. Made many guest appearances on the 1955-76 BBC cop show Dixon of Dock Green (which at one point featured among its cast future TBHS regular Anna Dawson). Not to be confused with the American voice-over announcer of the same name (and of Forensic Files fame). Janie Marden appeared in the April 20, 1968 edition performing "Lover, Come Back to Me" (she played Jeanette MacDonald to Benny's Nelson Eddy in the "Hollywood and the Stars: Partners" sketch). 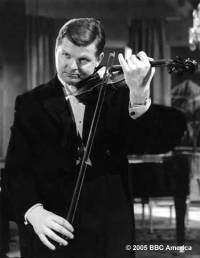 A popular singer and musical comedy star on stage and TV in Britain in the 1950's and '60's. She'd previously been on his show for a few editions in 1961. Singer Julie Rogers appeared in the "Philovite" ad parody from (prob.) Nov. 6, 1965. Was also on Mr. Hill's Nov. 6, 1964 and May 8, 1965 editions. She became an international star (and extremely popular cabaret artist) with her 1964 smash hit "The Wedding" which made the Top 10 in both Britain and America. Sylvia Tysick appeared in the "Household Cha-Cha" sketch of Mr. Hill's April 10, 1965 show which made the Montreux Festival (but did not win). She was predominantly a stage actress in Britain (from the late 1950's on) with credits including the London productions of West Side Story, Bye Bye Birdie, and Stop the World - I Want to Get Off! Her TV and film appearances were few and far between. Veteran character/comedy actress Doris Hare (1905-2000) appeared in the April 10, 1965 "Household Cha-Cha" sketch. Probably most famous as "Mum" in the 1970's Britcom On the Buses (and the movies based thereon). Played Mrs. Lea in three "Confessions of . . . " movies from 1975 to 1977. She played "Sister Mary" in the 1990 film Nuns on the Run which co-starred Eric Idle of "Monty Python" fame. Michael Malnick appeared in the original version of Mr. Hill's "Stük Butter" German ad parody as on April 10, 1965. His credits include the 1972 film The Darwin Adventure and the 1979 miniseries Ike (about Gen. Dwight D. Eisenhower). It was most probably Harry Seltzer (1909-2004) who appeared in character as Stan Laurel in the Laurel & Hardy segment of the "Hollywood and the Stars: Partners" sketch of April 20, 1968 which constituted his only TBHS appearance. This veteran variety tap-dancer was a long-standing member of the British showbiz charity "The Grand Order of Water Rats" (among whose members also include 1969-74 TBHS straight man Nicholas Parsons). Dave Griffiths appeared in the April 24, 1965 sketch, which would be remade as the runoff of Mr. Hill's Jan. 26, 1977 show. Eileen Nicholas played one of three girls terrorizing Benny in his own home in the "Phantom Phone Call" sketch from April 20, 1968 which was her only TBHS appearance. A supporting player on TV and in movies since the late 1960's. One of her most recent credits was as "Mrs. Renton" in the 1996 film Trainspotting. Sandy Duke also appeared in the "Phantom Phone Call" sketch of April 20, 1968. This was her only appearance on the show. Veteran character actress Doris Rogers appeared in the "Anglo-German Friends League" portion of the "24 Hours" newscast parody on Mr. Hill's April 20, 1968 edition. She also had the distinction of being in the very last BBC TBHS which aired on Dec. 26, 1968. Her credits dated back to the 1930's, and include the role of "Florrie Wainwright" in the radio and TV series (and 1954 movie) Life with the Lyons; her most recent credits in films and TV were in 1973-74. The late Gwendolyn Watts (1937-2000) appeared in the "English Lesson" sketch on Mr. Hill's April 10, 1965 edition. Her film credits include roles in Billy Liar, My Fair Lady, and three "Carry On" movies. Also appeared on such TV shows as Steptoe & Son (which spawned the American Sanford & Son), The Avengers, and the long-running British soap Coronation Street. Lindsay Scott-Patton appeared in the tail end of the "Police - Friend or Foe?" sketch where he's ogling two female police officers. This sketch appears to be from May 8, 1965, on which he made his only appearance on the show. Judy Russell made her only TBHS appearance on Jan. 8, 1966 as the narrator of "The Castle" sketch (remade at Thames in 1971 as "The Great Pretender"). The Jan. 8, 1966 edition featured Joe Gibbons in "The Castle" sketch. A supporting character player in films and TV from the late 1950's until his death in 1967. Patsy Noble made her first appearance on TBHS on Jan. 8, 1966. She would later change her name to Trisha Noble. The credits of "The Good, The Bawd and The Benny" compilation had her name misspelled as "Pasty Ann Noble." Miranda Hampton made her only appearance on TBHS on Jan. 8, 1966 at the end of "The Castle" sketch. Other TV credits include a role in the 1964-86 soap Crossroads, and guest appearances on other programs. John Howard was a child actor who appeared in the "One Step Behind" (TV sets coming to life) sketch of the May 22, 1965 edition. A few years after this appearance, his name changed to John Leverett, as per old editions of The Spotlight (London) casting directory. Wendy Barry appeared in the Nov. 6, 1965 edition of TBHS. Appeared in three movies, one of which was as a dancer in the 1967 flick The Young Girls of Rochefort. The dance duo Mandy and Vera appeared on Mr. Hill's Nov. 6, 1965 edition with Benny in the "Fred and the Debutantes" section of the "Opportunity Calls" sketch. Not much is known to this individual about them. Studio 1 of BBC's Television Centre (opened 1960; called "TC1" by insiders) was the location of the "Hollywood and the Stars: Partners" sketch. All of Mr. Hill's comedy/variety shows from 1964 to 1968 had the studio segments taped there. Many other popular BBC programs over the last four and a half decades emanated from that studio. Hope this is all of some help for I.D. purposes. - William Brown. The following notes were written by William Brown and contain a great deal of background info on the BBC years. Thanks, William! Just as Benny skewered Thames often during his time there, so had he the BBC when at that venue. Sir Hugh Carleton Greene, Director General of the BBC from 1960 to 1969, was often a target of his barbs. In the 11/27/65 "Audience Researcher" sketch, for example, Jeremy Hawk asks Mr. Scuttle who makes the programming decisions, and he responds "Hugh and I." This was a double-meaning, though; not only was he implying that he worked with Mr. Greene, but the response itself was a reference to a TV comedy on the Beeb at the time called Hugh and I, starring Hugh Lloyd and Terry Scott. In the "Opportunity Calls" sketch, Benny's host was called "Hughie Carleton Green," a double-reference to Sir Hugh and Opportunity Knocks host Hughie Green. These actors' names I cited, are the ones I know for sure about. I'm waiting for a release of the complete surviving BBC shows on DVD, with full original end credits and all, to see who else was on each show, to see who else is who. Other than that, I'm not about to speculate.Hughie Green. The earliest surviving BBC TBHS was April 26, 1958. Though the Mrs. Biscuit interview (later redone on his Feb. 18, 1976 "Word of Sport" sketch) was used, that show also had an early version of "Pepys' Diary" which he did on two Thames shows, Feb. 24, 1971 and May 1, 1989. I see that the "Soap Commercial" was an early version of the 2/4/70 "Making a Commercial." Trisha Noble, at the time of her first appearance on Jan. 8, 1966, was known as Patsy Ann Noble (as she is called in the guides on top). She adopted her other moniker more than a year later - which perhaps was just as well, given "The Good, The Bawd and The Benny's" calling her "Pasty Ann Noble" in the specially made end credits. I wonder if, besides her hair dye job to what it had been at the time of her later 1970 appearance, she'd had a nose job as well, looking at both her earlier and later appearances. The Nov. 6, 1964 and April 10, 1965 editions were from 35mm film kinescopes (or, as they're called in Britain, "telerecordings"); thus some parts may be unclear to this individual; as may be the April 26, 1958 show. All others came from 16mm kine's. The April 10, 1965 episode was the BBC's entry into the Montreux festival, which may explain its being 35mm. Some Scuttle interviews, and certain other sketches, I couldn't ascertain the date; in such instances there are blanks where numbers should be. On the back cover, the middle-aged woman in the picture with Benny as an appraiser, was Joan Ingram. I noticed most of the color publicity photos in the section on the site came most likely from his very last show for the BBC, on Dec. 26, 1968. Henry McGee's presence was a key, as was June Whitfield. John Derrick played the ship's captain in the Nov. 27, 1965 "Passengers of Passion" sketch. Even in BBC days, he often skewered supporting players' names. In the ersatz "credits" for the 11/27/65 "Passengers of Passion" sketch, I noticed "Patricia Haystack" (for Ms. Hayes), while Bridget Armstrong's name was parodied as "Brigitte Strongarm." That show had as musical guest Salena Jones whose name was combined with Lord Snowdon (a.k.a. Anthony Armstrong Jones) to form "Selina Armstrong Jones." This was a precursor to such puns as "Helen Hornet" (for Helen Horton). Yes, it's the Susan Clark of Webster fame who was on that May 8, 1965 show. Yet she's not nearly as associated (in terms of her past) with TBHS as, say, Jane Leeves. But then, at the time Ms. Clark was on, the Hill show's rep hadn't yet gone down the toilet as it had when Ms. Leeves appeared - that, plus Benny being all but unknown in America in 1965. In my previous correspondence, I submitted a pic of Pam Beckman as she appeared in the 1968 "Phantom Phone Call" sketch. The other girls in that part as she was in, were Eileen Nicholas (the dark-haired one) and Sandy Duke (the light blonde with the small ears and hookish nose; not to cast aspersions, mind you, just an observation). Perhaps a clue as to the origin of some of the material is the quality of the filmed kinescopes.